The red Moenkopi sandstone peaks of the Fisher Towers are one of the most photographed sites in Utah. Their rigid summits stretch high into the open skies and on clear days, the juxtaposition of red rock against brilliant blue makes for an imagine that’s worth making the trip just to capture. 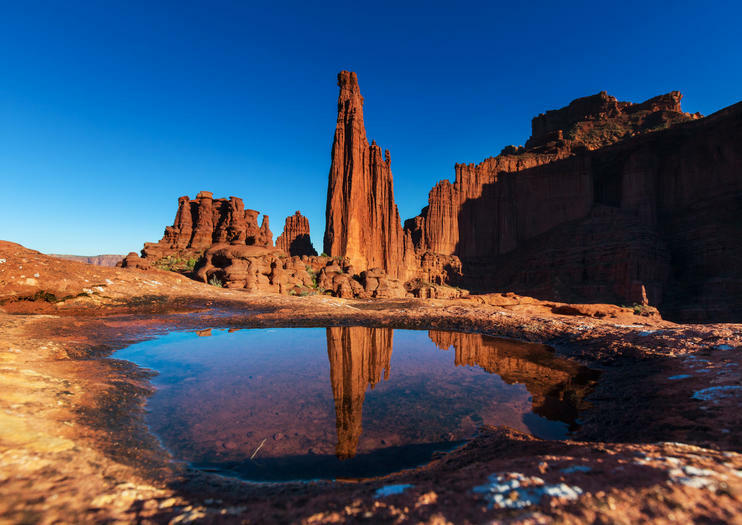 Outdoor enthusiasts and avid climbers say challenging passes like Finger of Fate, Titan Tower and Stolen Chimney make Fisher Towers is a destination for thrill seekers, and they caution that the dangerous twists of the famous Cork Screw tower are not for the faint of heart either. Fisher Towers is located 16 miles southwest of Moab. It is accessible from Route 128, between I-70 and Route 191. Raft past Fisher Towers during this half-day river rafting trip on the Colorado River, not far from Moab. Drift past the red rock scenery while you paddle downstream through a series of gentle rapids. This family-friendly excursion includes personal flotation devices, dry bags and, of course, your river guide. This white-water rafting trip covers a 14-mile (22-km) section of the Colorado River near Fisher Towers, a short drive from Moab. Stunning canyon scenery provides awe-inspiring vistas throughout the day. The full-day adventure features oar rafts operated by river guides, although inflatable kayaks are usually available upon request. At lunchtime, your guide serves a buffet-style picnic during a stop on a riverside beach. Join a family-friendly river rafting or kayaking trip and paddle past stunning Moab scenery, including Fisher Towers. Your full-day excursion launches at Onion Creek and covers some great white water of southern Utah. Munch on a delicious riverside lunch before running more rapids. This small-group tour is suitable for all ages and skill levels, with your choice of raft or kayak.